New Delhi, Nov 9 (IANS) The family of the seven-year-old boy murdered in the Ryan International School campus in Gurugram has demanded that the CBI must question the Pintos, the founders of the school, and that the arrested 16-year-old student of the school, now a prime suspect, should be tried as an adult. "The CBI should grill, interrogate and arrest the Pintos' family," Barun Chandra Thakur, father of murdered Class 2 student Pradhuman Thakur, told IANS. He also said that the Pintos should not be given any "leeway" just because they are "high and mighty". "They should not go scot free from this incident (murder). Earlier on two occasions they have been able to go scot free pertaining to the deaths of two kids in other branches of the school," he said. The CBI in the Punjab and Haryana Court had opposed the anticipatory bail plea of Ryan Augustine Pinto, CEO of the school. 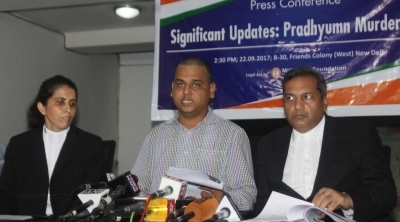 The owners of the Ryan School -- Francis Augustine Pinto, Grace Pinto and Ryan Pinto -- had filed the anticipatory bail petition in the Punjab and Haryana High Court which granted interim bail to them till December 5, which has been challenged by Thakur in the Supreme Court. Thakur, a resident of Madhubani in Bihar, said that it should not happen again in this case. He said CBI should not leave any stone unturned to bring out the actual culprit behind the murder. The probe should go into aspects like negligence, lapses and deficiencies in the school premises, which have been confirmed and acknowledged by the CBSE in its fact-finding report, he said. "The case was baffling and it is still baffling now. The entire CBI theory should legally sustain and should be established because after the Aarushi Talwar case the institution of the CBI as a whole and its credibility is in the dock," he said. "The bungling that happened in the (Aarushi) Talwar case should not happen in this case. We want that justice should be delivered to all in this case," he said. Thakur said he "hoped" that the CBI has taken all forensic, scientific and circumstantial aspects into consideration while reaching the conclusion that a Class 11 student of the school is the prime accused. Commenting on the prime suspect, Thakur said, "I would like to say one thing clearly that this boy is a major, and not a minor since he is 17 years old." "And as per the new amended Juvenile Justice Act he has to be tried as an adult and Juvenile Justice Board (JJB) has to constitute a medical board to ascertain the mental framework, culpability and criminality of this 17-year-old," he said. He also said that he will not leave efforts to get the suspect student tried as an adult and to be given the "death penalty" because it is a "heinous and gruesome crime that comes in the rarest of rare category", Thakur said. Commenting on the Haryana Police probe into the case so far, Thakur said, "It is pathetic, it is shameless on the part of the Haryana Police to frame someone to get out of the bind because of public outcry." "The theory propagated by Haryana Police was totally unbelievable for us and, therefore, right from day one we have demanded a CBI enquiry and even approached the Supreme Court seeking it," he said. School bus conductor Ashok Kumar was arrested by the Haryana Police a day after the murder of the Class 2 student. Pradhuman's parents and two other staffers have maintained that the conductor was being made a scapegoat and that someone else committed the crime. Thakur also said that he was satisfied with the current CBI probe into the case. His remarks came a day after the CBI brought a new twist to the murder of Pradhuman in Gurugram on September 8. The CBI on Wednesday said that the crime was committed by a 16-year-old student of the same school who wanted the upcoming exams to be postponed. The revelation by the CBI completely derailed the Haryana Police's claim that a bus conductor, Ashok, in jail since then, was the killer.